One would have thought that sustained attention to an author’s work was itself an acknowledgement of the significance of that work. Such thinking lay behind my writing and serializing this review in the pages of Christian Renewal. To my knowledge, this series has not been met with substantive response dealing with its claims and analysis. 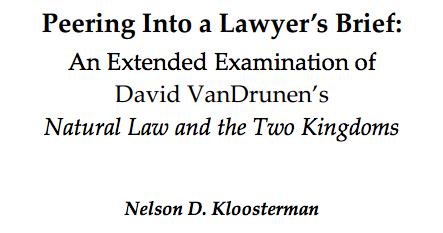 So we offer our review in this ten-chapter, 82-page ebook, entitled Peering Into a Lawyer’s Brief: An Extended Examination of David VanDrunen’s Natural Law and the Two Kingdoms. Our purpose remains the same: to invite readers to reflect on the arguments, and if they are inclined, to join the conversation. Dr,K., will you make this booklet available in print? Some of us hate lengthy reading on-line! I’m sorry, but I have no plans to do so at this point.